Box Text: PREPARE To Face Your DEMONS! A young knight named Nero witnesses the slaughter of Sanctus, the Order of the Sword's beloved leader. 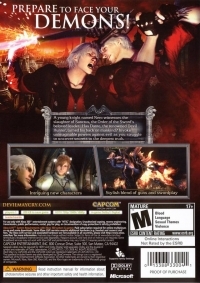 Has Dante, the renowned Devil Hunter, turned his back on mankind? Invoke unimaginable powers against evil as you struggle to uncover secrets to the deepest truth. 01-24-2016 lugnut Description Also available in "Capcom Essentials" compilation release. 08-24-2011 scott Box Text A young knight named Nero witnesses the slaughter of Sanctus, the Order of the Sword's beloved leader. Has Dante, the renouned Devil Hunter, turned his back on mankind? Invoke unimaginable powers against evil as you struggle to uncover secrets to the deepest truth. 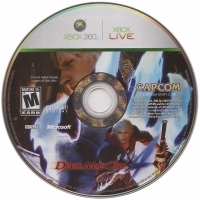 This is a list of VGCollect users who have Devil May Cry 4 in their Collection. This is a list of VGCollect users who have Devil May Cry 4 in their Sell List. 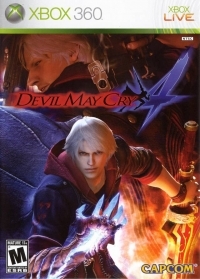 This is a list of VGCollect users who have Devil May Cry 4 in their Wish List.